This CD was discovered almost 3 years after the 8-track demo CD was auctioned on eBay and is basically a copy of the aforementioned demo, excluding "She Couldn't". It is believed this was done due to legal problems surrounding the sample used in the song, as Mike Shinoda said that, for legal reasons, he couldn't talk much about "She Couldn't". The band signed a record deal with Warner Bros. Records as Hybrid Theory in April 2000, but there was another band on the label called Hybrid and the label didn't want Hybrid Theory getting confused with them, so they had to change their name to Linkin Park and Hybrid Theory became the title of their debut album instead. 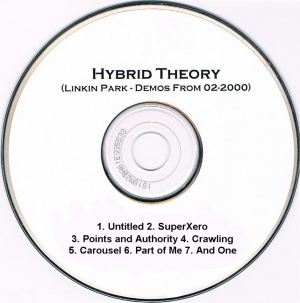 The text on the CD indicates that the demos contained in it are dated from February 2000. The CD contains the same mixes as featured on the 8-track demo CD, but all the songs are completely without static. A copy of the CD was obtained by community member Ginger and made available for free download by fan site LPAssociation on May 20, 2012. This page was last edited on 9 February 2017, at 15:41.